Members of the Brazilian air force point out specific landing zones for their aircraft during a tour on their squadron during a week-long exchange focused on enhancing Search and Rescue, May 15 in Campo Grande, Brazil. During the week-long exchange, Air Forces Southern members were merged with their Brazilian counterparts and received an up-close view of how their Brazilian colleagues enable the SAR mission. 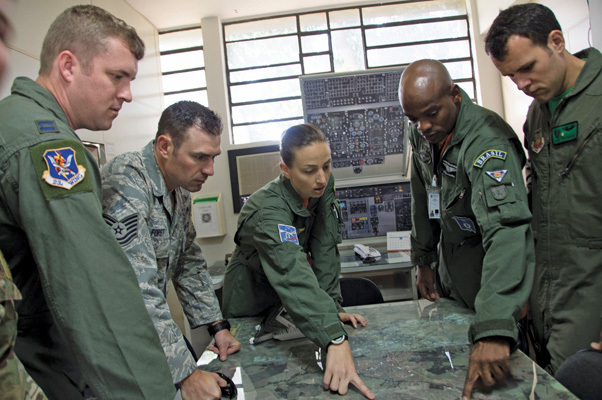 Campo Grande — U.S. Airmen traveled to Brazil to participate in a week-long subject matter expert exchange with members of the Brazilian air force, from May 11-15, focusing on Search and Rescue capabilities. 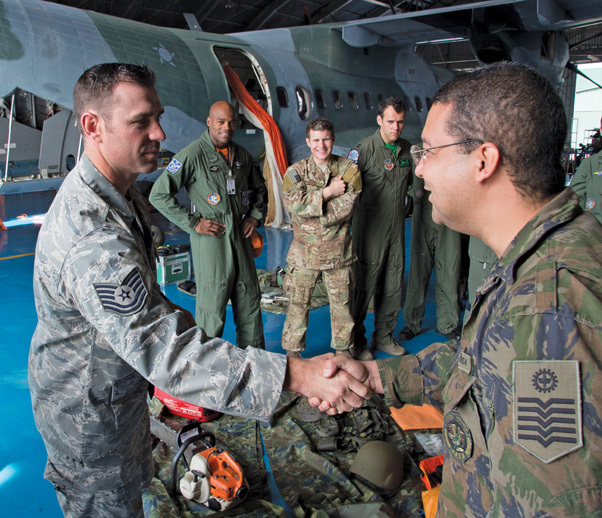 The Airmen from Air Forces Southern’ s 347th Rescue Group and 571st Mobility Support Advisory Squadron, supported a week-long exchange of SAR best practices with a goal of strengthening the partnership between the United States and the Brazilian air forces. Through continual SMEE engagements with partner nations like Brazil, the U.S. military is able to show support to our allies and partners, as well as collaborate with other nations to address common security challenges and help promote regional security. The week consisted of presentations from both air forces to showcase how they executed SAR operations, followed by a field exercise day, and a tour of their squadron to meet the men and women who make it possible to perform their missions. On the last day of the exchange the team was met by the commander of the base. 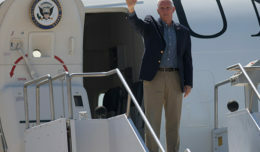 Airmen from 12th Air Force (Air Forces Southern) routinely visit partner nations in Central and South America, as well as the Caribbean to exchange knowledge and ideas covering a variety of military disciplines. 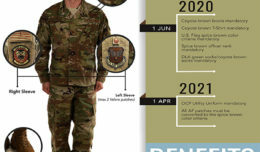 Tech Sgt. Daniel Foret, 571st Mobility Support Advisory Squadron survival, evasion, resistance and escape specialists, shakes hands with a member of the Brazilian air force’s air crew flight equipment section after a demonstration on their capabilities, May 15 in Campo Grande, Brazil. Members of AFE are responsible for ensuring the equipment assigned to air crews is properly maintained. 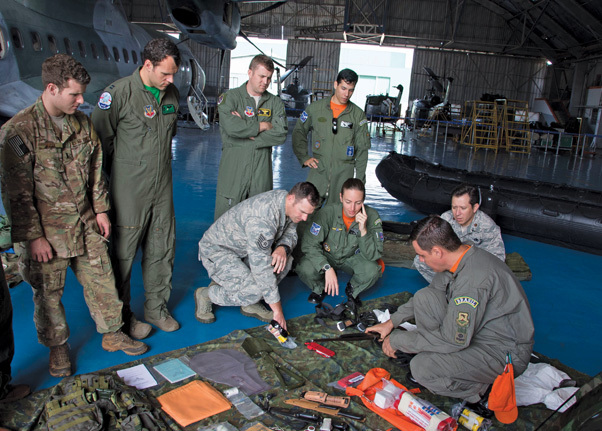 Members of the Brazilian air force present emergency safety equipment from an aircraft to members from Air Forces Southern, May 15 in Campo Grande, Brazil. The equipment being showcased is pivotal to the survival of the air crew in a worst case scenario where the aircraft crashes. 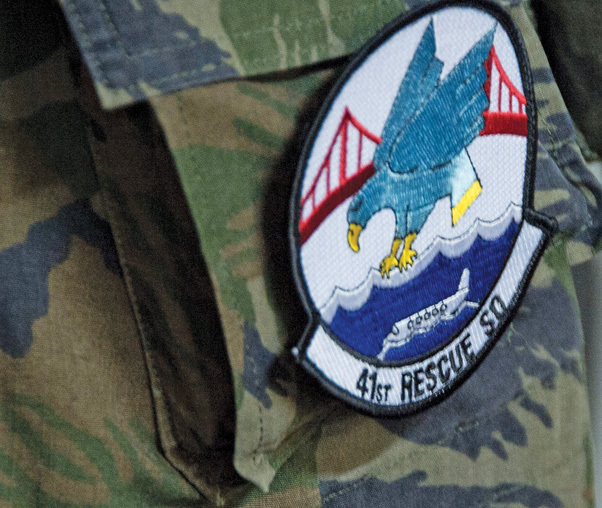 A member of the Brazilian air force wears a patch from the 41st Rescue Squadron after swapping patches with Capt. John Tucciarone, 41st Rescue Squadron HH-60 helicopter pilot, on May 12 in Campo Grande, Brazil. During the week long exchange Tucciarone spoke to the capabilities of the HH-60 Pavehawk helicopter and its role in Search and Rescue. Tech Sgt. 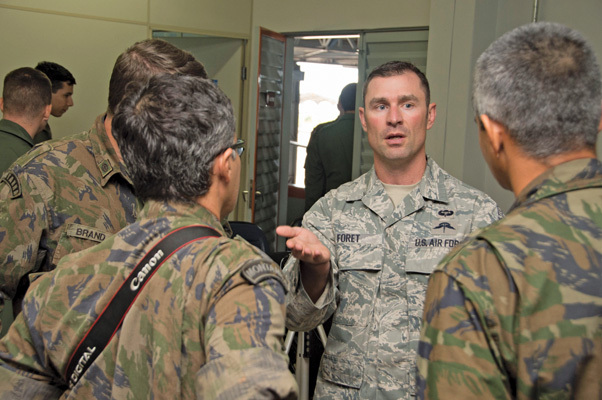 Daniel Foret, 571st Mobility Support Advisory Squadron survival, evasion, resistance and escape specialists, speaks with members of the Brazilian air force after a presentation on May 11 in Campo Grande, Brazil. 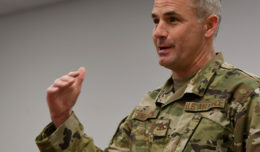 Foret spoke and explained the importance of SERE specialists and how they can be utilized to train forces. 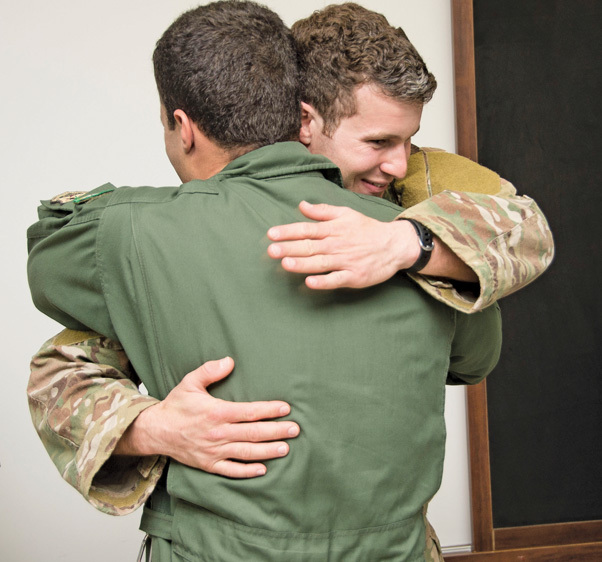 1st Lt. Evan Terry, 38th Rescue Squadron combat rescue officer, hugs a member of the Brazilian air force during the closing moments of a week-long exchange focused on enhancing Search and Rescue capabilities, May 15 in Campo Grande, Brazil. During the week long exchange Terry shared details of his role and responsibilities as a Combat Search and Rescue Officer.